“Becoming the first Rays player ever to pitch a no-hitter has been a great experience. I really couldn’t have done it without the support from my team. 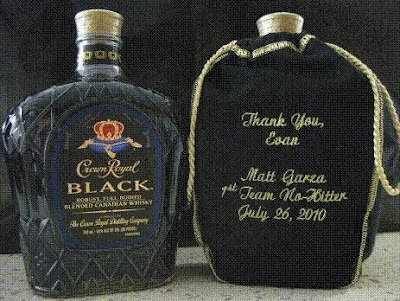 To thank them for their nine innings of hard work, I decided to give them a personalized embroidered bag and bottle of Crown Royal Black. That way, we can all celebrate together when enjoying the new whisky,” said Garza. I like Matt Garza a whole lot more now. You have to appreciate the pitcher's taste in adult beverage. The bag is a pretty sweet touch. More importantly, how cool are the Rays. Now I just imagine them hanging out in the lockeroom after games sipping whiskey and smoking cigars while sexually harassing female employees. Or I'm thinking of Mad Men. Either way, still cool. The celebratory booze might just be a stocking stuffer too since Garza is reportedly finalizing a "separate surprise." If I were a Ray, I'd be hoping for a pygmy giraffe from the DirecTV commercial.